By Vadim Tropashko - Vadim is the author of "SQL Design Patterns", the experts guide to SQL programming. How to compare the content of two tables is one of the most popular topics on Ask Tom forum. In this article, we'll investigate performance of three different table comparison techniques. 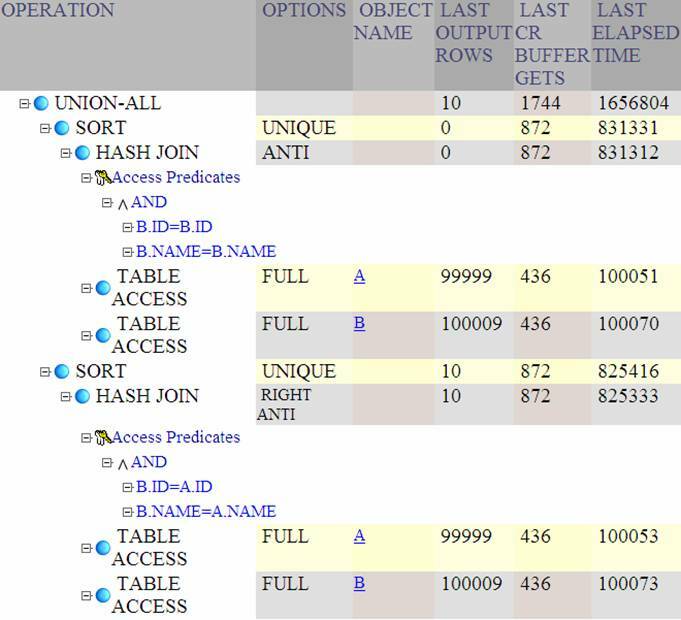 Among the other things, this case study is an entertaining journey into oracle optimizer performance arena. Suppose there are two tables A and B with the same columns, and we would like to know if there is any difference in their contents. In the set theory a similar question is well known as a symmetric difference operation. A reader with an Object Oriented programming background might wonder why the Relational model in general, and SQL in particular, doesn’t have an equality operator. You'd think the first operator you'd implement for a data type, especially a fundamental data type, would be equality! Simple: this operator is not relationally closed, as the result is Boolean value and not a relation. Figure 1: Symmetric difference of two sets A and B can be expressed as either (A \ B) ∪ (B \ A), or (A ∪ B) \ (A ∩ B). In practice, however, this query is a sluggish performer. With a naïve evaluation strategy, the execution flow and the operators are derived verbatim from the SQL which we have written. First, each table has to be scanned twice. Then, four sort operators are applied in order to exclude duplicates. Next, the two set differences are computed, and, finally, the two results are combined together with the union operator. From the performance perspective, this approach appears to be far from optimal. First, each table has to be scanned twice. Second, four sorts have to be done on top of that. If confirms our intuition on the number of table scans and sorts. It also reveals that the time scanning a single table (about 100 msec) is small compared to the time spent when sorting each table (about 450 msec). Therefore we could try to aim lower than 2.4 sec of total execution time. evidences about 30% improvement in execution time, which is considered small by optimizer standards. Note that in more realistic case, tables would probably have more columns, but most likely they might already have an index associated with primary key. The less intrusive way to influence an access path is hinting. But how could we hint the join method when there is no join in the query as written in the first place? OK, this might be a convenient opportunity to discuss hint enhancements in 10g. Let's get bird's-eye view into query optimization architecture in oracle, first. 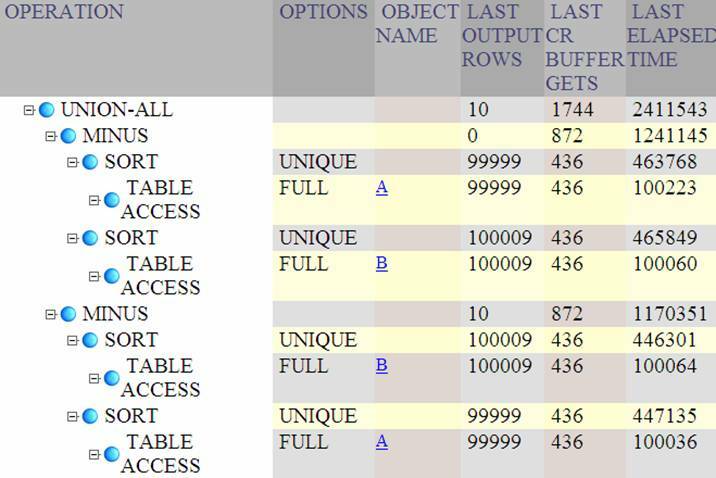 The basic query structure in oracle RDBMS engine is query block. A subquery, an inner view, an outermost select statement that contain those, all are query blocks. 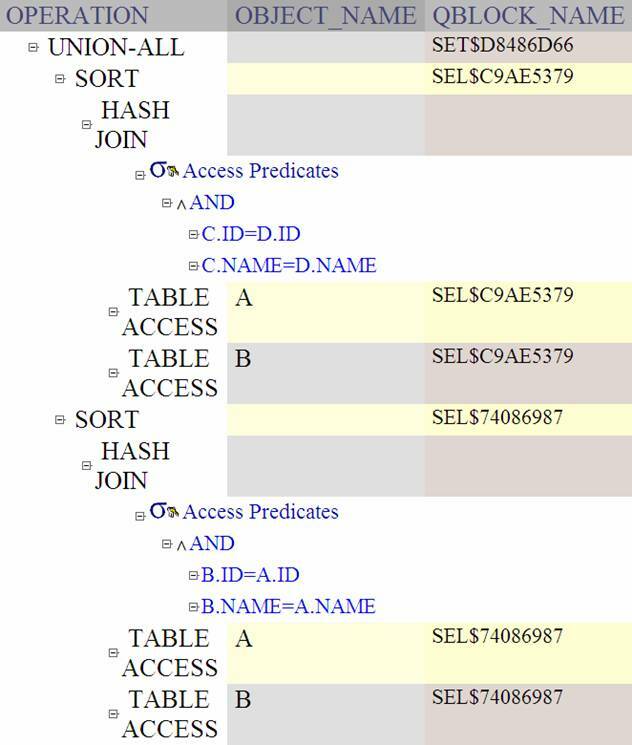 The particular query that we are studying in this section has 5 query blocks: 2 pairs of selects from the tables A and B, and one set operation. After this query is transformed, it would consist of only 3 query blocks which we might witness from the QBLOCK_NAME column of the PLAN_TABLE. I included the LAST_STARTS column into result set in order to double-check that index rowsource node has been started exactly once per each row scan in the outer table. 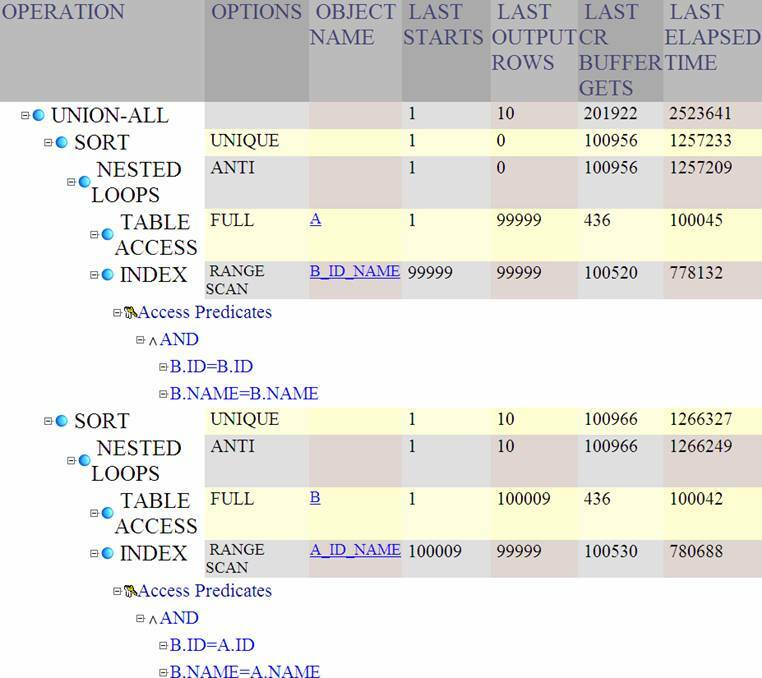 Specifically, B_ID_NAME index node has been started 99999 times and processed 99999 rows total, therefore each index scan probed 99999/99999=1 row in the inner table B only, as if the index were unique. From the statistics output we see significant increase in buffer gets which is not offset by any noticeable improvement in the execution time. It is fair to conclude that indexed nested loops didn't meet our performance expectations in this case. Although we succeeded decreasing buffer gets count in half, the execution time still remained around 2 sec. Is there any difference? The expected answer is boolean. What are the rows that one table contain, and the other doesn't. Answering the second question implies that we can answer the first, yet, it is possible that the first query might have better performance. We’ll approach it with the hash-based technique in mind. The standard disclaimer of any hash-based method is that it is theoretically possible to get a wrong result. The rhetorical question, however, is how often did the reader experienced a problem due to hash value collision? I never did. Would a user accept a tradeoff: significant performance boost of the table difference query at the expense of remote possibility of getting an incorrect result? The idea of hash based method is associating a single hash value with a table. This hash value behaves like aggregate, and therefore, it can be calculated incrementally: if a row is added into a table, then a new hash value is a function of the old hash value and the added row. Incremental evaluation means good performance, and the two hash values comparison is done momentarily. Figure 2: A method to “weight” a table into a single value involves concatenating all the fields per each row first. Then a concatenated string is mapped into a number -- hash value. Finally all hash values are aggregated into a single one. Had a single field in a single row have change, the table weight would change as well. Row hash values are added together with ordinary sum aggregate, but we could have written a modulo 216-1 user-defined aggregate hash_sum in the spirit of CRC (Cyclic Redundancy Check) technique. Many thanks to Rafi Ahmed for patiently answering my numerous questions about query transformation in Oracle RDBMS. The aggregation solution has been suggested by Marco Stefanetti in an exchange at Ask Tom forum. Vadim Tropashko graduated from Moscow Institute of Physics and Technology in 1984. Tropashko researched Petri Nets for five years following graduation. In the early 90s, his interests switched to OOP. Tropashko translated "The C++ Programming Language" by B.Stroustrup into Russian. In the mid 90s, Tropashko's interest switched from OOP to databases. He published numerous research and programming articles and authored the book "SQL Design Patterns" (Rampant Tech Press).